Manufactured sand or M-Sand is a replacement of natural river sand made artificially from hard granite stone by crushing. M-sand is cubical in shape and edges are rounded. 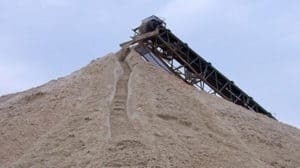 After crushing, the sand is clearly washed and graded properly for using as construction material. Generally, the size of M-sand is less than 4.75 mm. M-sand is gaining its popularity and uses over vast construction works due to several advantages which are described below. 1. Manufactured sand is graded very well at their right proportion. 2. Organic and soluble compounds are eliminated which can affect the properties and setting time. 3. In this sand no impurities are available such ads dust, clay, silt coatings etc requires more water as on account of river sand which makes weaker the cement-aggregate bond. Therefore the quality and durability of concrete are increased. 4. M-Sand is produced from granite using latest techniques which ensure their required properties. Here high carbon steel hit rock and then Rock On Rock technology is used which is also similar to the natural process of river sand formation. 5. Modern and imported machines are used to manufacture M-Sand which gives cubical shape and confirms their proper gradings. Also Read – How To Check Sand Quality In Field.